P'unk Burger will now carry milkshakes made with The Franklin Fountain ice cream. 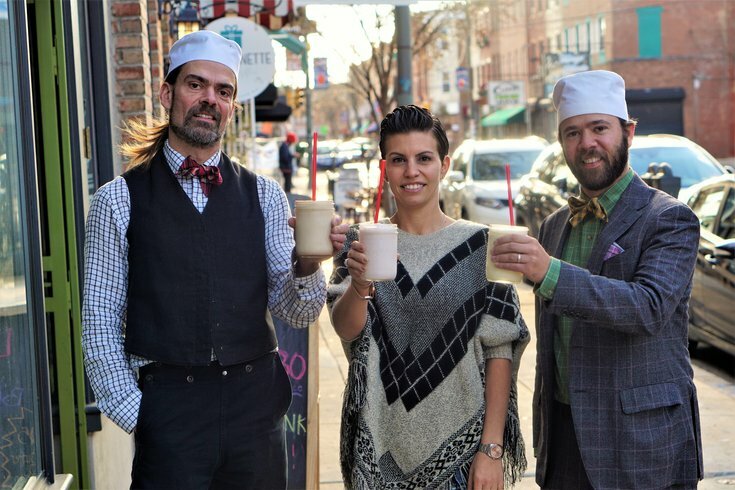 The East Passyunk restaurant P'unk Burger now serves milkshakes made with Old City's famous The Franklin Fountain ice cream. To start off the partnership, three holiday flavors debut this month. One is vegan. • Gingersnap Eggnog Custard – Features home cooked custard made with egg yolks, candied orange peel, fresh nutmeg and a touch of brandy. • Cinnamon – Made with Sumatran Cinnamon from Red Ape. It’s non-GMO, organic and 5 percent of the profits go toward helping orangutans. • Non-dairy Peppermint Stick – Handmade crushed red and green peppermint candy ribbons are swirled in coconut milk-based peppermint ice cream. All milkshakes with The Franklin Fountain ice cream are $8. The three seasonal flavors are also available at P'unk Burger by the scoop or in a float with Maine Root natural soda. Each month P'unk Burger will feature different flavors. P'unk Burger is at 1823 Passyunk Ave.